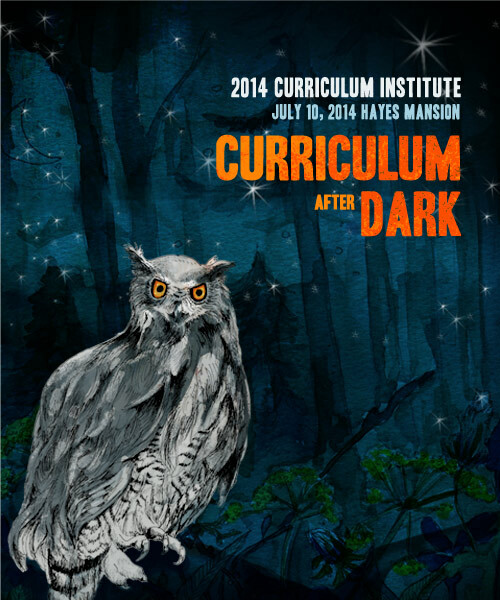 2014 Curriculum Institute will take place on July 10 - 12, 2014 at the Hayes Mansion in San Jose. Welcome to the 17th annual ASCCC Curriculum Institute! Curriculum is the heart of the California Community College System as we work diligently to serve the diverse needs of our communities. As with anything of such value, the workings of the heart become complicated and we sometimes stumble through the dark. At least here we can stumble through the dark together. Last year’s theme was Everything Under the Sun, so this year, we have the dark side planned for you; welcome to the Curriculum After Dark. The Curriculum Committee has designed a program of essential information and navigational aids, process and procedural breakouts, as well as several veins you might explore including noncredit, career technical education, and technology. Often we become blinded by the myriad facets of our tell-tale regulations and structures that we may neglect such vital pathways to the same curricular core. This is an excellent time to explore and collect information and ideas that will strengthen your local college. Lastly, there is a discussion strand where no formal presentation is prepared, but an opportunity to share what local practices are successful and learn from colleagues. Building a sense of community among those intimately involved in curriculum has been a life-saver for many. Due to the overwhelming response, registration for this Institute is closed, however, we have created a waitlist. If you would like to be added to the waitlist, please email Tonya Davis, ASCCC Events Coordinator, at tonya [at] asccc.org with the subject line "Waitlist for Curriculum Institute". Please include in your email your name, college, phone number you can be reached at and your email. When we receive a cancellation, we will contact those on our waitlist in the order their request was received. Please contact Tonya Davis, ASCCC Events Coordinator, at tonya [at] asccc.org or 916-445-4753 x 104 with your payment information. The cancellation deadline for a full refund was May 28, 2014. Refunds will not be granted for cancellations after the posted cancellation deadline of May 28, 2014. Please keep in mind that registrations are transferable. Please review the Senate Cancellation Policy here.Call Tonya Davis, Events Coordinator, at (916) 445-4753 x 104 with any payment questions. The Hayes Mansion located at 200 Edenvale Avenue, San Jose, Ca 95136 is the host hotel for this year's Institute. Once a lavish private estate, the Hayes Mansion stands as one of the South Bay's most impressive and distinctive historical structures. Surrounded by lush, emerald green lawns, accented with gardens of vibrant, colorful flowers and guarded by towering palm trees, the 100-year old estate has been refurbished, upgraded and transformed into a luxurious hotel, conference center, resort and spa. Dolce Hayes Mansion is an environmentally friendly hotel using green standards such as: carbon off setting, recycling, reduction in paper usage, towel and sheet reuse as well as other energy efficient measures. Steeped in tradition and rich in history, the mansion provides visitors with an extraordinary experience. This quiet haven, complete with sweeping mountain views, offers the perfect venue for business meetings, special events, weddings or relaxing getaways - just 15 minutes from San Jose International Airport and 45 minutes from San Francisco and Monterey. Driving directions can be found here. Parking is complementary for all attendees. For those flying to Northern California, there are four airports to choose from: San Jose (the shortest driving distance), San Francisco International, Oakland and Sacramento. There is not a free shuttle from the airport to the hotel, however, the staff at Hayes Mansion can help arrange for transportation from the San Jose International Airport. Click here for more information on arranging transportation with Hayes Mansion staff assistance. There is not a free shuttle from the airport to the hotel. Those staying at the Hayes Mansion can contact hotel staff to help arrange for transportation from the San Jose International Airport. Click here for more information on arranging transportation with Hayes Mansion staff assistance. Super Shuttle also services the San Jose International Airport to Hayes Mansion starting at $25one-way. Super Shuttle can be reserved online or by calling (800) BLUE-VAN (800-258-3826). Please check our website below to get details about our onsite shuttle service and the shuttle times to plan your trip accordingly. Due to the overwhelming response, the Hayes Mansion quickly sold out of hotel rooms. Accommodations have been secured for those that have been notifed at a nearby hotel, the Four Points by Sheraton San Jose - Silicon Valley. We will provide those attendees with shuttle services throughout the conference. A Shuttle will be available to service thier needs between Hayes Mansion and Four Points beginning Thursday July 10th through Saturday, July 12th. Shuttle service will only be provided from Hayes to the Four Points during the conference times and the Thursday night reception and dinner. We are currently finalizing the shuttle pick up/drop off times and details. This information will be posted on the event website, and onsite at the Institute. Please contact Tonya Davis, ASCCC Events Coordinator, at tonya [at] asccc.org or 916-445-4753 x 104 with any questions. Our room block at The Hayes Mansion is currently sold out! Below is a list of nearby hotels. Please note that a room block has not been established at the listed hotels.